When you actually think about it, email is a real technological marvel, letting you ping someone on the other side of the world in a second, with as many GIFs, emojis and attachments as you like. But email is so convenient, we tend to rely too much on it. As a result, many of us are struggling to stay on top of the tide of incoming emails, but by following the tips we've laid out below, you can work your way back to inbox zero and a clean, clear email app again. If you're ready to start the great email purge, then read on. 1. Set your own schedule. If you check emails as and when they come in, you'll never know how long it's going to take to deal with them, or when you'll be distracted from some "real" work. Instead, set aside fixed chunks of time to get on top of your messages. 2. Use multiple email addresses. Having a back up email address (or two) is always handy, because you can use it for all those not-so-important registration forms and apps, leaving your main inbox for incoming messages that are actually worth dealing with. 3. Apply stars or leave messages unread. The biggest obstacle to reaching inbox zero is worrying that something important will get lost - but you can still star emails or leave them unread as you archive them, which makes them easy to find again in the future. 4. Don't run other apps at the same time as your email client. The best scientific studies we have suggest that multitasking is an illusion - we're just doing lots of jobs not very well - so keep your email breaks (see the first point) specifically for email alone. 5. Keep your replies short - or don't reply at all. The studies show that shorter emails lead to shorter replies, and if you really want to cut down on the number of incoming messages you get, stop replying to your emails completely unless it's really necessary. 6. Explore the alternatives. Good old email has been with us since the 1960s, depending on your definition, but today we have plenty of alternatives you can use instead of emailing people (and getting emails back) - think instant messages or even calls. 7. Declare email bankruptcy. Every once in a while it's not a bad idea to just clear out everything from your inbox and start again - chances are that if there's something really important in your inbox that needs dealing with, you're going to hear about it again. 8. 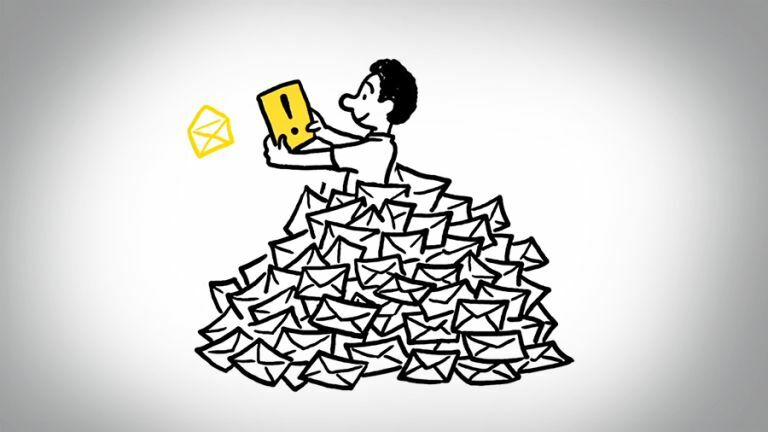 Don't let email overload stress you out. You only have part control over how many emails show up in your inbox, so don't feel like a failure if you can't get to inbox zero, because it doesn't mean you're any less organised or focused than someone who can. 9. Snooze emails in Inbox by Google. Google's alternative email app is one of several clients that can perform this trick, letting you "snooze" emails until a later time or even another day. It helps you to get through your mountain of emails that little bit quicker. 10. Set up bundles in Inbox by Google. Another excellent feature in Inbox is the Bundles feature, which groups together certain kinds of messages so you can deal with them quickly in bulk. You can quickly set up your own Bundles for easier email organisation. 11. Automatically filter messages in Gmail. Filters are one of the key strengths of Google's main email app - you can set them up from the Settings page on the web and have messages matching certain keywords or certain senders skip the inbox altogether. 12. Make use of Priority Inbox in Gmail. Gmail will automatically sort your email for you, if you let it, so less important messages can be dealt with en masse at the end of the day. On the web click the settings cog then Configure inbox to choose your inbox categories. 13. Set up gestures in Apple Mail for iOS. Power through emails on the go inside Apple's default mobile email client by swiping left or right on them to mark them as read or archive them. Head to Mail and then Swipe Options in Settings to set up the gestures. 14. Rely on search in Apple Mail for macOS. Not the only email app with a decent search function, but it recently added natural language options, so you can look for "emails from yesterday" for example. Archive your emails en masse and rely on search to find them. 15. Keep your inbox focused in Outlook. Getting some automated help on the road to inbox zero is always welcome, and Outlook's mobile apps provide it with their Focused Inbox view, sorting out top priority messages for you. It's coming to the web interface, too. 16. Create your own rules in Outlook for Windows and macOS. Outlook's rules work a little bit like Gmail's filters, and they let you offload a lot of your email sorting to the app itself. To get started, click Rules then Create Rule on the Home tab of the ribbon menu. 17. Unsubscribe from everything with Unroll.me. You could work through your inbox manually, clicking on all the unsubscribe links you find, but Unroll.me makes the process much easier - it works with numerous services and gets you much closer to inbox zero. 18. Get your emails in groups with BatchedInbox. Despite our best intentions, it's all to tempting to check up on emails every two minutes, but BatchedInbox solves this problem - it will collect up all your incoming Gmail messages and deliver them on a schedule. 19. Find what's important with SaneBox. SaneBox is an advanced email filtering system that works alongside whatever email software you use now, analysing your incoming and outgoing messages to work out which are most important and archiving the rest for you. 20. Get automatic reminders with Boomerang. A lot of inbox clutter is caused by us keeping around messages to act as reminders to do something, but Boomerang for Gmail lets you clear out emails without forgetting them, and schedule sending emails too. 21. Don't forget follow-ups with FollowUpThen. Just like Boomerang, FollowUpThen gives you the freedom to clear out your inbox without worrying that you're going to forget to do something or get back to someone - and it works with almost any email platform. 22. Export your emails elsewhere with Newton. Newton works across Android, iOS and macOS (Windows "coming soon") and while it'll cost you, it's worth it. One of its best tricks is exporting emails to other services like Evernote and Trello, cleaning up your inbox. 23. Send quick replies with Spark. One of the best email clients currently on iOS and now macOS as well, Spark comes with built-in smart replies that let you power through your pending messages without having to do too much typing (or even thinking). 24. Move between different Gmail accounts with Checker Plus. If you've got more than one Gmail account (for work and personal use, say) then you've got double the work to get to inbox zero, but Checker Plus helps you stay on top of multiple accounts more easily.